Mayweather vs McGregor could deliver worst knockout blow to bookmakers in sports betting history. Ask anyone what’s going to happen tonight, and most will tell you Floyd Mayweather is going to destroy the younger, far-less experienced Conor McGregor. Others say the 29 year old Irish youngblood is primed to decimate Pretty Boy’s good looks with a devastating knock-out blow. The bookies in Las Vegas and cyber-la-la-land are of the former opinion. They’ve set the stakes high for a Mayweather win, with odds fluctuating around -500 and -600 for the last few days. In the meantime, cheap, high-yielding bets on McGregor are getting more attention than bookmakers would like. 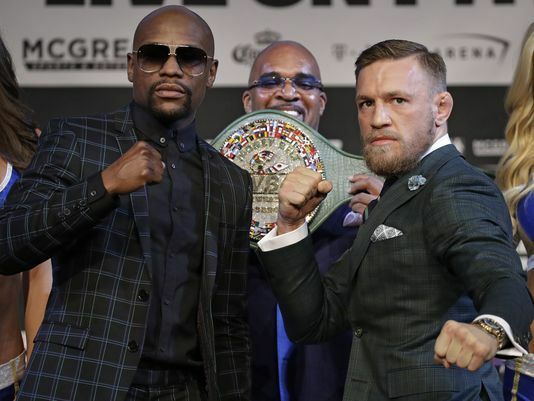 If the latter turns out to be reality, and Conor McGregor somehow sends Mayweather to the mat for a 10-count (because the odds of an outright 12-round, judge-rule victory are ridiculously mycoplasmic), sports betting history will be made this Saturday night. It’s not just the volume of bets coming in, either, but the sheer size of them, some exceeding the million mark. According to USAToday, MGM took in a $1M bet on Floyd at -550, worth $180k for a win. A bettor at William Hill Nevada dropped $1.2M on the Pretty Boy at -500; a $240k payout for the likely win. Other reports of multiple $300k wagers are coming in. These huge bets are driving Mayweather’s odds ever farther into the minus, up to -600 at many bookmakers. But at the same time, it’s driving the profitability of a McGregor victory to phenomenal heights. And that’s got a lot of punters taking the low-risk, high-yield option. At this point, if McGregor pulls out a miracle, the amount of money bookies will have to shell out is expected to far surpass any single-event loss in sports betting history. It’s not that millions are being dropped on McGregor, but rather, as Will Hill bookie Nick Bogdanovich told CNBC, the frequency of smaller bets on the Irishman adding up. He said bookmakers could be pounded with multi-million dollar losses, the worst in sports betting history on a single event, if McGregor wins in any capacity. Should he fulfill his promise of an early KO, the losses for Vegas would be far worse. Bookies are adjusting their odds in the other direction now, but they say it’s not helping to hedge their bets. Mayweather opened with an average 11-1 favor, as has since dropped to 5-1 or less at many sportsbooks. Still, bettors are dropping C-notes on McGregor left and right, hoping for a huge payoff. At +450, a $100 bet on McGregor would be worth $450. As one bettor reportedly did at South Point this week, dropping $50,000 on the Irish MMA expert—who, might I add, has never fought a genuine boxing match in his life—will pay out $225,000 for a win. Despite bracing for potential record losses, Bogdanovich said Las Vegas will survive, and survive well, if the unthinkable happens following tonight’s bell. Reminding bettors that they can win, and win big, will keep them returning to the sportsbooks in the future.